Renee Walker’s first scene in 24 – she pulls Jack Bauer out of his Senate Hearing and drives him to FBI headquarters. Jack Bauer gives Renee Walker his sleeper hold and then hogties her with a phone cord in order to break Tony Almeida out of FBI headquarters. Litvak finds Renee Walker and turns her over to his boss, David Emerson. Jack Bauer and Tony Almeida (secretly undercover) both tell Emerson not to kill her. What Do You Think, Jack? That’s all that matters, right Jack? A police officer gives Marisa Donoso’s belongings to Renee Walker. 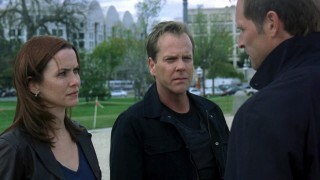 Jack Bauer tells Renee that they did what was necessary and she needs to learn to live with it. Renee Walker hugs Jack Bauer and says they can finally rest. If only things were so simple in the world of 24. Renee Walker saves Kim Bauer in the 24 Season 7 finale. Renee Walker attempts to get to the bottom of the conspiracy by questioning Alan Wilson. Wilson denies any involvement and Renee grabs him by his shirt.